I published a piece on Quartz Africa about the recent news that Nigeria plans to send an astronaut into space by 2030. The article looks at the history of the Nigerian space program — as well as the email scan involving a lost astronaut that has taken the internet by storm. You can read the article here. Nigeria is on the verge of passing a terrible law that would send people to jail for two years for their Tweets and Facebook posts. At my organization Access Now, we’ve been working with civil society groups in Nigeria to oppose it. I published an op-ed with ‘Gbenga Sesan, executive director of Paradigm Initiative Nigeria, in Premium Times Nigeria, one of the country’s leading newspapers. You can read the op-ed here. You may have been the lucky recipient of a Facebook post asking for money to help rescue a lost Nigerian astronaut. I can reassure you that I didn’t write it, even though I’m the author of a novel called Nigerians in Space. The email claims that a Nigerian scientist’s brother was the first African in space, but was left stranded on a secret Soviet space station when his seat to return to Earth was replaced by cargo after the collapse of the Soviet Union. The author, one Dr. Bakare Tunde, requests the sum of $3 million to help rescue his brother, who has apparently been in space since 1990. (Yes, 26 years.) That sum will unlock nearly $15 million in back pay, which Dr. Tunde will split with you for your generosity. The letter is a little dated. It didn’t take much sleuthing for me to discover that this scam has been running since at least 2004, when The Register uploaded the text of the email to its website. Someone has cleverly re-shared it on Facebook, and it’s now going viral across the web, spurred on by sites like BoingBoing, because our collective memory for these sorts of things holds as much capacity as a TI-82 graphing calculator. But let’s take the letter on its own terms. The story is actually very well researched, as preposterous as that may sound. Nigeria does indeed have a National Space Research and Development Agency. I visited the agency in Abuja in 2014 and wrote in Slate about how the scientist I met closely resembled a fictional character in my book. Nigeria has a reputation for launching troves of outrageous email scams, sometimes called 419 scams, for the section of the criminal code under which they are prosecuted in Nigeria. One strategy is to send out as many of the emails as possible and hope that a tiny percentage falls for the scam. The fact that the astronaut is African may make the letter seem absurd — but the vast majority of victims believe that Africans are too innocent and stupid to try to steal their money, and fork it over nonetheless. Russia probably launches the most spam attacks in the world, to my knowledge, but 12 years later Nigerians are still trying sophisticated phishing and hacking schemes. What do both countries have in common? A wealth of tech talent with too few employers to hire them, meaning they try to make money through illicit means. But in 2014, Nigeria surged forward to become the continent’s largest economy. We’ll see if plummeting crude oil prices — the anemic lifeblood of the economy — will slow that growth, but the country of 175 million already has millions of talented youth who thrive online, whether on their smartphones or the lightning-fast broadband of posh Victoria Island in Lagos. Is the scam funny because we can’t envision Nigerians going into space on their own initiative? This would be a troubling indictment of African progress, or at least of our perceptions of African progress, because, again, there has been a lot of it, especially in technology. Or is the scam funny because all of us know that if the astronaut lived in space for 26 years, surviving on a supply of secret Soviet oxygen, his bone structure would be decimated, because he presumably hasn’t been exercising on a cosmocycle, and he would now be a primordial pancake with no bone mass or musculature? I’m currently writing the sequel to Nigerians in Space — and there will be astronauts, and brainy Africans, and criminals, too — and it’s a shame that I can’t turn to some of Nigeria’s most creative writers for inspiration, because, for the moment at least, they may still be operating underground. On Facebook this time. Maybe it’s not so ridiculous? Check out this film starring Clint Eastwood, which imagines a secret Soviet satellite that mistakenly activates a nuclear warhead, and appeared in theaters four years before the email was written. Okay, I realize that many email scams are composed by more than one author, but I am not privy to that editing process. You could also guess that the email wasn’t written by a Nigerian at all, but by a stoner who happened to know about African space programs, and wanted to pin something on the Soviets and their space station. Knock out two birds with one stone, if you will. Key Creatives, 2009. 112 minutes. District 9 has taken the American box office by storm. The film depicts the arrival of aliens in the unlikely locale of Johannesburg, South Africa. Establishing contact with alien life forms in the movies is never as simple as we’d like it to be. But this picture moves beyond a B sci-fi flick with some penetrating social commentary. At times satirical and other times allegorical, the story skillfully interweaves the history and culture of South Africa with mecha-robots and spaceships. The vagaries of the film industry have resulted in the film being released in the U.S. before South Africa, subverting one of the central themes of the film — that America is not the center of the world. I still expect the reception in South Africa to be a positive one. Here are 10 Things that you may not know about District 9. Note: the following list does not spoil the plot of the film. But those wishing to see the movie with a blank slate should not read it. The title District 9 is a play on District Six, a famous neighborhood in Cape Town located not far from the Central Business District. The area was known for its diversity and its thriving arts scene. Labeled unsanitary by the National Party, the government was also concerned that races mixed relatively freely in the neighborhood. It was consequently designated a whites-only zone and razed to the ground. The residents were relocated to areas both within and outside Cape Town. 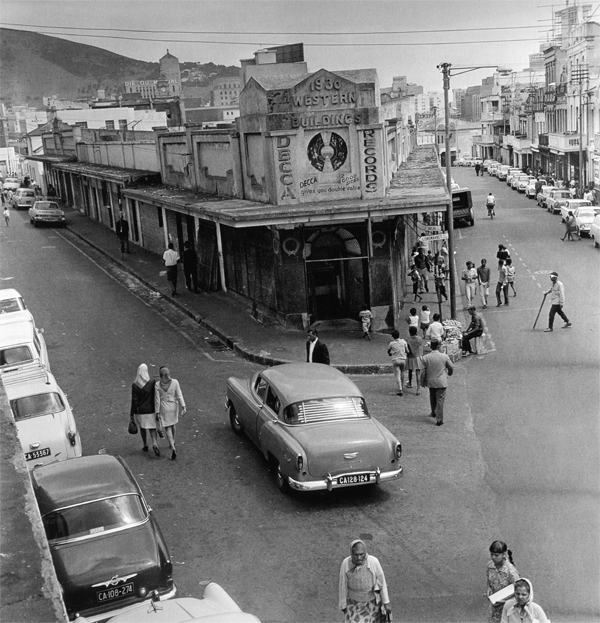 Today, the government is gradually rebuilding District Six. A phenomenal museum is dedicated to the neighborhood. The alien ‘prawn’ ships in the film land in South Africa in 1989. During this time, the country was still under a State of Emergency and the ANC was a banned political party. Over 20,000 people were killed during the next five years. The Goldstone Commission revealed that much of the violence was instigated by the apartheid government by pitting ethnic groups and political groups against each other. Nelson Mandela was released from prison in February 1990. Richard Goldstone, who headed the Goldstone Commission, is currently investigating atrocities in the Gaza Strip. In the film, Multinational United (MNU) is a large multinational arms conglomerate. Arms manufacturing remains one of South Africa’s largest industries. This is a direct product of the Apartheid regime, during which South Africa developed a strong military that invaded neighboring countries and maintained order within its borders. In fact, current President Jacob Zuma was implicated ‘by inference’ in a $5 billion arms smuggling scandal in 2005. This scandal resulted in Zuma being stripped of his post under Thabo Mbeki. A number of evidentiary blunders by a poor prosecuting team resulted in the case being dropped — paving the way for Zuma’s current presidency. The other figure involved in the scandal, Schabir Shaik, was sentenced to fifteen years in prison. In District 9, one of the MNU mercenaries brutishly declares, “one bullet, one prawn” while attacking the aliens. This is a deliberate play on the mantra of the Pan Africanist Congress, an anti-apartheid political group. The PAC proffered a “one bullet, one settler” slogan, indicating that whites should be shot until power returned to indigenous South Africans. The PAC was pushed aside when Mandela’s more moderate African Nation Congress gained power — and never let go. Many former PAC ‘combatants’ are now serving jail time or are ‘unemployable’, meaning that they lack the skills to participate in the modern South African economy. In the film, Nigerians are portrayed as gun smugglers, pimps, and cannibals. Nigerians have had an unsavory reputation in South Africa since before the fall of apartheid. In truth, they occupy both the top positions in South Africa — as academics, businessmen, and activists — but also the lowest — as drug dealers and gun runners. Nigerian gangs have been known for violently dominating the tik (crystal methamphetamine) trade. While most Nigerians live peaceably, it is not uncommon for landlords to refuse to rent to Nigerians or for employers to refuse to hire them. Organ smuggling and religious body part smuggling have occurred in Nigeria but it is clearly illegal and practiced by a tiny number of outlaws. Unfortunately, this reputation has resulted in some bizarre stereotypes. 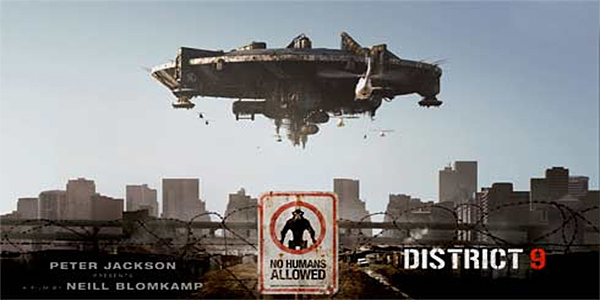 District 9 is at heart a satire but these images could use a *bit* more qualification. I write about these stereotypes in my fiction. 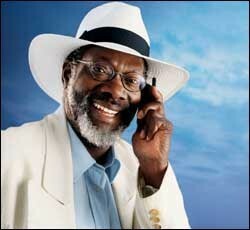 The photo above is Bankole Omotoso, probably the most famous Nigerian in South Africa, a professor and actor who became known by playing an elderly South African man for the mobile phone company Vodacom. All aliens are required to maintain identification in District 9. 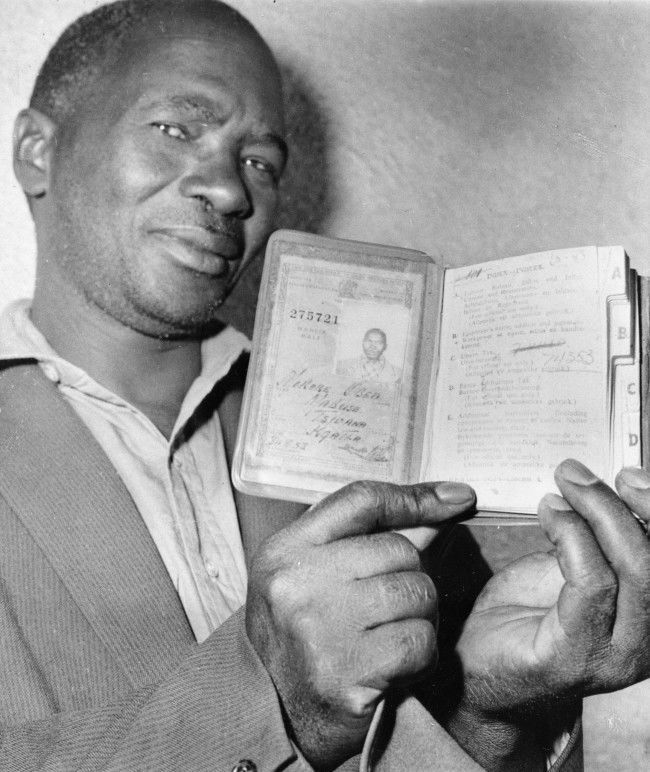 While many societies require residents to carry identification, South Africa has a particularly sordid history. Passes were utilized as a mechanism to control the non-white labor force in South Africa. The passes needed to be regularly updated and missing stamps or signatures could result in imprisonment or banishment to rural areas. Both Mahatma Gandhi and Nelson Mandela fought strongly against passes. The country remains an ID-obsessed country — particular with respect to refugees. The word ‘township’ is an apartheid-era euphemism for neighborhoods divided along racial lines. Townships suffered from a lack of basic services and poverty. During apartheid, townships were routinely raided by the notoriously violent ‘Peri-Urban’ police force just like the MNU agents in the film. Today the settlements around Johannesburg, both legal and illegal, sometimes number more than 1 million people. Townships such as Soweto (the Southwest Territories) have permanent homes and shacks. The government is attempting to build housing to eliminate shacks but service delivery remains poor. For an amazing account of the township of Alexandra, located near a garbage dump like the one in District 9, check out Mark Mathabane’s Kaffir Boy. Mathabane went on to become an international tennis star. In the film, the alien Prawns have an insatiable appetite for cans of cat food. Upon traveling to the Eastern Cape or other traditional territories, South Africans often advise bringing ‘sweets’ for the kids. They hand out candy and other treats in order to win affection and, often, safety. Such measures are suggested in order to prevent the children from ‘killing you for your wristwatch,’ a typical apartheid-era myth. Both black and white MNU operatives work together against the Prawns. Although most films depict apartheid as having been perpetrated solely by whites, the South African Police Services did in fact have a large number of black officers. The aliens utilize a strange, click-heavy language in the film. Yet some MNU agents learn to speak the language. South Africa possesses eleven official languages, several of which use ‘clicks’. Xhosa has the most click consonants, having incorporated clicks from a variety of ethnic groups around South Africa, including the San. It is not easy for a non-native to learn to use these clicks and this is compounded by the fact that Xhosa is a tonal Bantu language. The non-European sounds of Xhosa helped whites differentiate themselves from indigenous South Africans and emphasized their alien-ness. Archbishop Desmond Tutu famously stressed this point by forcing a white lawyer to properly pronounce his client’s name during the Truth and Reconciliation Commission proceedings.